I would like to gather a variety of photographs of Mondrian and details of the various places he lived. There are already several sites charting the periods of his life - I will include links to these rather than repeating the effort. The initial brief biographical notes are taken from the catalogue for the Whitechapel Art Gallery exhibition, 1955  and these are gradually being supplemented with detail from other sources, notably the excellent Rue du Départ  . There is a full list of sources at the bottom of the page. Most of the images will enlarge when clicked. The information on Mondrian's studios is summarised in a blog here. Text biographies - Mondriaanhuis Foundation  . 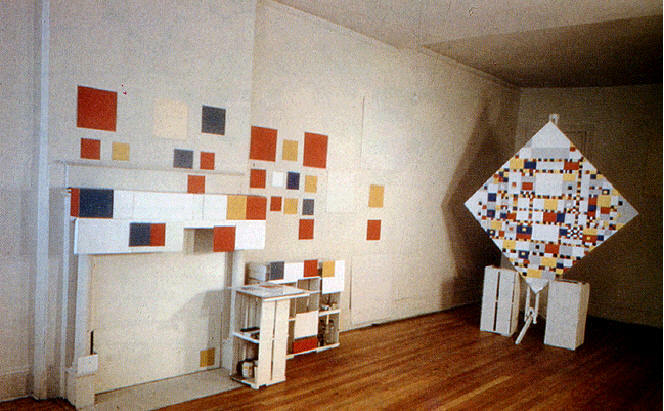 1938-39 This is a detail from one of my favourite Mondrian photos, taken from Deicher's Structures in Space [4 p92] . There is no information given on the circumstances. 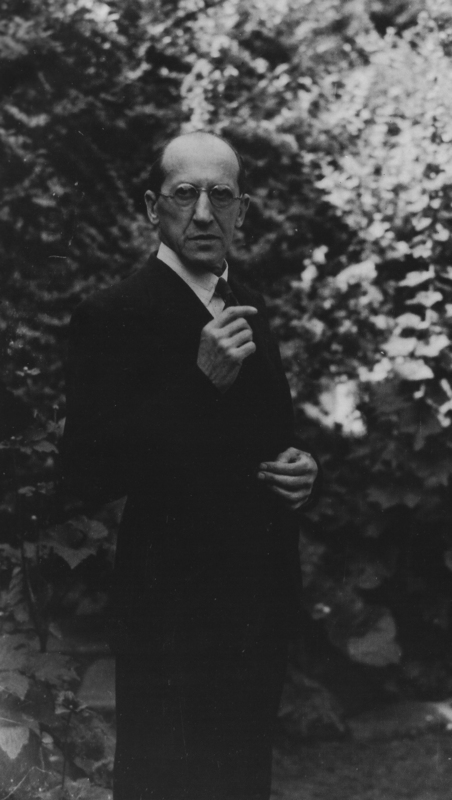 An article in Studio International magazine, December 1966 (reproduced here ) describes the picture as Piet Mondrian, photographed by Cecil Stephenson in 1938 or 1939. 1872 Pieter Cornelius Mondriaan was born in Amersfoort on March 7th. He was the eldest of five children. His father was a headmaster and was fond of drawing. 1880 The family moved to Winterswijk. He began to draw and paint at an early age. He obtained instructions and lessons from his father, from his uncle: the painter Frits Mondriaan, and from the Doetichemse painter Jan Braet von Ueberfeld.Obtained elementary and intermediate drawing diplomas by private study. Carel (1880-1956), Pieter Cornelius (Piet), Johanna Christina (1870-1939), Willem Frederik (1874-1945), Louis (1877-1943). 1892-1897 For three years attended the painting classes held by the Rijks academie in Amsterdam under August Allebe and then attended the evening course for another two years. 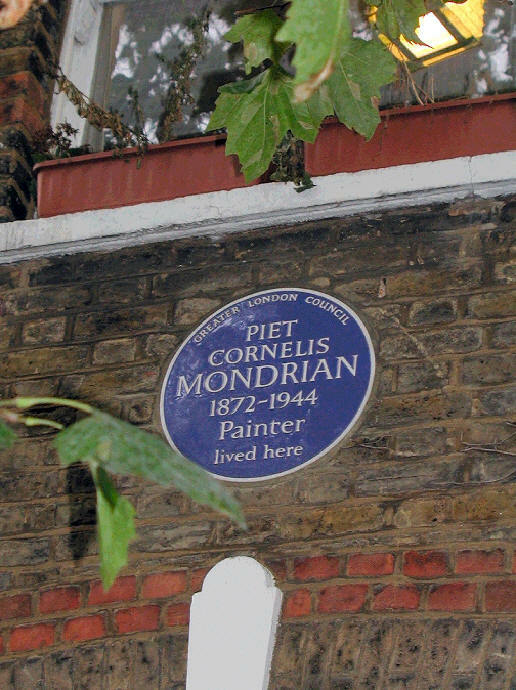 According to the Mondriaanhuis biography entry for 1897, Mondrian wanted to study Art in England but could not obtain entry. 1897-1904 Worked in the neighbourhood of Amsterdam, at Amstel, Gein (often together with Simon Maris) and Vecht, among other places, and also on a few occasions in Brabant for a short time. In order to earn his livelihood, he made copies in museums: portraits and scientific drawings for Professor van Calcar in Leiden (1905-1906). Painted landscapes particularly in the style of the Hague and Amsterdam impressionists. Admired Breitner. Piet Mondrian and his friends, 1903. Mondrian, Maris and d'Ewoud Groeneveld before embarking for Bilbao. Piet Mondrian in Spain, 1903. Simon Maris and Mondrian at a bullfight. 1904 Another from the Maris archive dated 1904. Mondrian and Maris and friends on the banks of the Gein, summer 1904. 1904-05 Lived in Brabant at Uden. During this period he began for the first time consciously to seek his own less subjectively impressionistic style. 1905-08 Returned to Amsterdam. 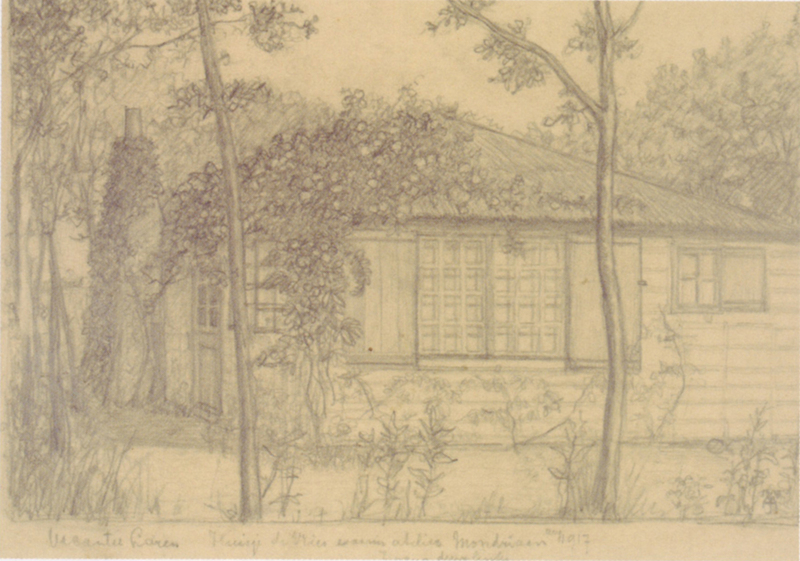 First had his studio in the St. Lucas garret in the Rembrandtplein and later lived at 272 Albert Cupstraat. Was a member of St. Lucas and exhibited with this Association until 1910. For those giving him commissions he painted occasionally in the older style. In these years his work sometimes had a symbolic thread. 1907 Worked the entire summer at Oele near Hengelo in Overijssel with the painter Hulshoff Poll. In 1908 he probably stayed for a short time in Domburg. Knew and admired Jan Toorop and became friendly with Jan Sluyters. At the beginning of 1909 a big exhibition together with Corn. Spoor and Jan Sluyters in the Amsterdam Stedelijk Museum. Here he exhibited Fauvistic work for the first time. 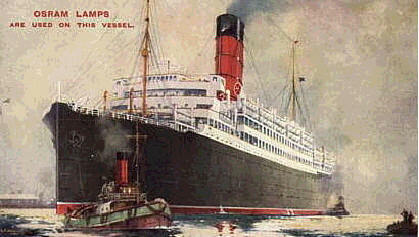 1910-11 Returned to Amsterdam. 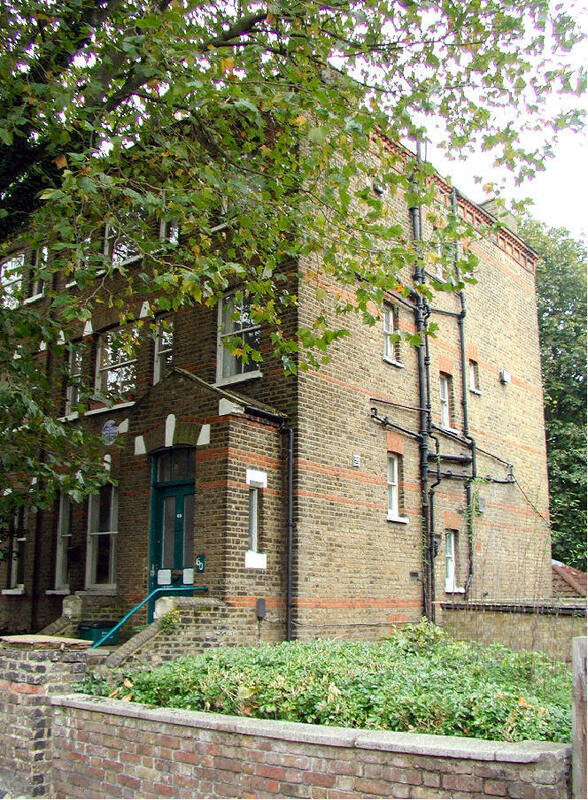 Lived at 42 Sarphatipark. Sought to tauten his form, went over to cubism. Was a joint founder of the Moderne Kunstkring (Modern Art Circle). 1911 On December 20th he went to Paris on the advice of Conrad Kikkert. Settled at 26 Rue de Départ, where Kikkert and Lod. Schelfhour also lived. He admired the cubist work of Picasso and Léger and rapidly developed further interest in that direction. 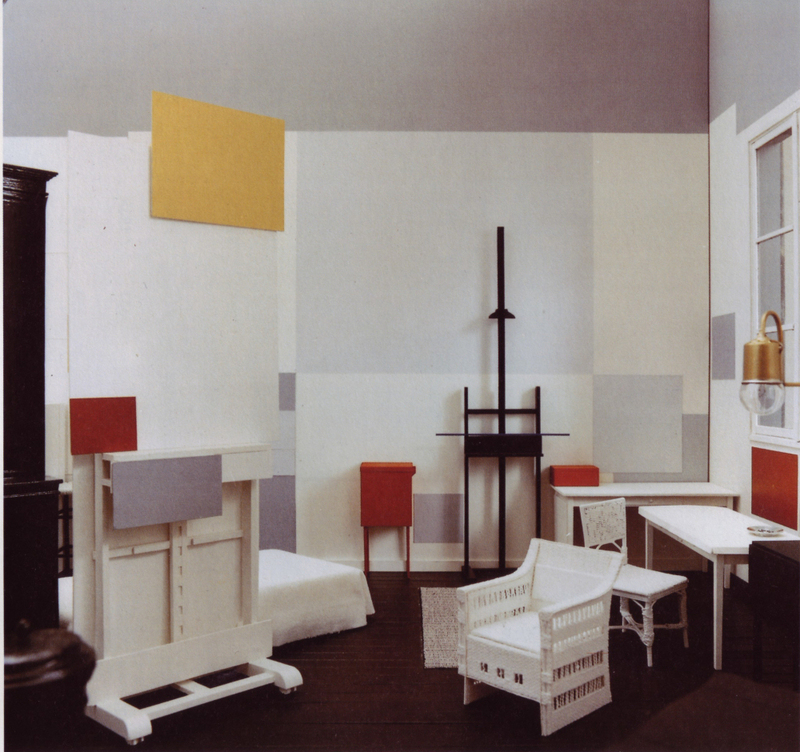 A photograph by Alfred Roth of Mondrian's studio on the top floor, 26 Rue du Départ, Paris, 1928. 1911-16 Via cubism he progressively diverged farther away from representation in the direction of abstraction without specific subject (series: trees and facades). 1914 Returned to Holland for a short visit but was compelled to stay four years owing to the outbreak of the first world war. Stayed for a short time in Domburg and for the rest of these years lived at Laren. 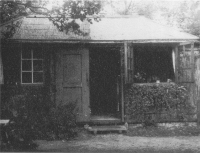 The picture of the studio in Laren is from the Logboek. 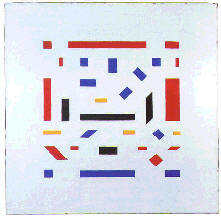 1915 Made the acquaintance of Theo van Doesburg. 1916 Made the acquaintance of Bart van der Leck , whose experiments with flat colour were of importance for his further development. 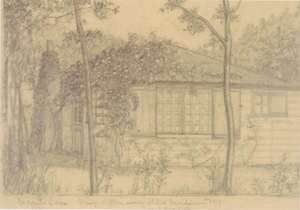 1917 Drawing of Mondrian's studio by Jan Hendrick Maronier, from the Gemeentemuseum Catalogue. 1919 With van Doesburg and some others he was the founder of the Journal De Stijl (Style) . and published a series of articles therein. 1917-20 Returning to Paris, Mondrian lived first on the top floor of at 5 Rue du Coulmier, then settled again at his old address of 26 Rue du Départ and, in March 1936 moved to at 278 Boulevard Raspail. 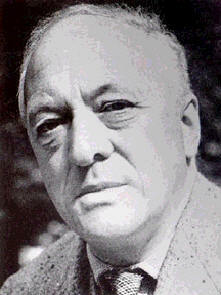 1920 Leonce Rosenberg attended to the publication of his writings Le Neo-Plasticisme , in which he set out his ideas regarding the Nieuwe Beelding (Neo Plasticism). From 1920 onwards, he permitted only horizontal and vertical lines and primary colours in his work. 1922 A review exhibition was organised in the Amsterdam Stedelijk Museum by the Hollandse Kunstenaarskring (Dutch Circle of Artists) on the occasion of his fiftieth birthday. 1925 A difference of opinion regarding Neo-plasticism caused him to break with van Doesburg. 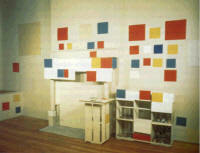 From then on he no longer worked on De Stijl . The Weimar Bauhaus published Neue Gestaltung , a translation of his Le Neo-Plasticisme . 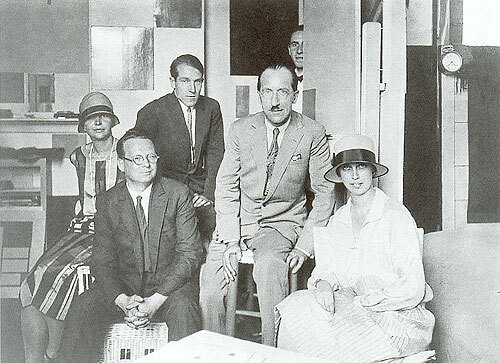 1926 Willi Baumeister in Piet Mondrian's studio, Paris 1926 (from left: Gertrud Stemmler, Willi Baumeister, Julius Herburger, Piet Mondrian, Michel Seuphor, Margarete Baumeister). From Willi Baumeister's web site. 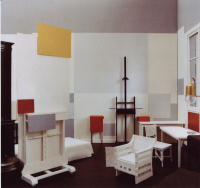 Reconstruction of Mondrian's studio at Rue du Départ, from the book of that name  . 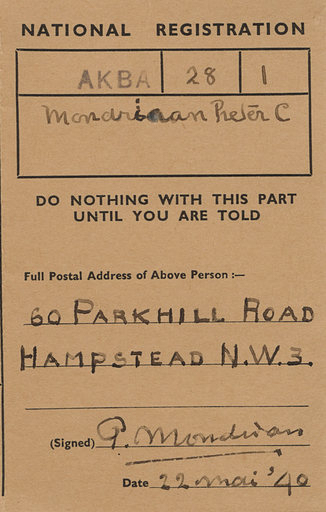 And from the same source, this is Mondrian's card with his sketch of how to get to his flat [2, p31] . The building was demolished in the late 1930s. 1926 Thanks to Miss Dreier, takes part for the first time in a big exhibition in America [5 p435]. pic? 1930 Exhibition in Paris of the Circle and Square group, of which he is one of the most important members [5 p435]. pic? 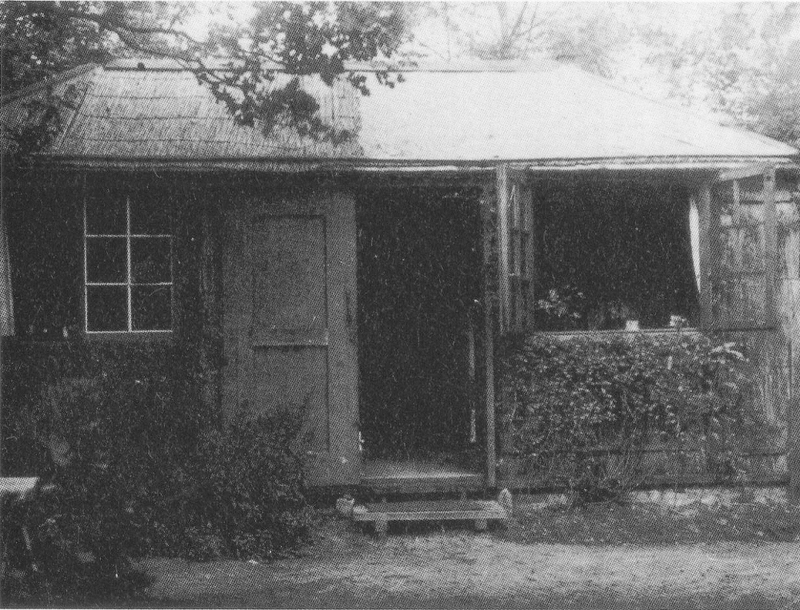 1936 Leaves Rue du Départ and takes a studio at 278 Boulevard Raspail. 1938 The threat of a second world war made him decide to leave Paris, setting out on 21st September. 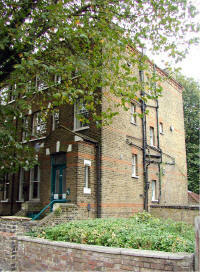 He first stayed at the Ormonde Hotel, Belsize Grove, then moved to 60 Parkhill Road, NW3. Here he was in contact with the English group of artists known as Circle , which included Nicholson, Hepworth, Martin and Gabo. I'll have to go and photograph it myself, if it is still there, in the meantime, here's a map . Here it is, snapped on a dull October day (20th Oct 2002), together with his (traditional London) Blue Commemorative Plaque, added in 1964. 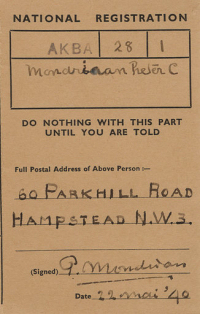 The second image shows Mondrian's GB registration document. Thanks to the current occupants for their cooperation. Apparently, he used a studio at the rear of the ground floor. It is currently occupied by another artist and recently flooded, tragically destroying all her work. The Ormande is now flats. I will get a snap of the building soon. Here's a map . 1940 Here's what I have been looking for - the Catalogue notes that he 'departed from Liverpool aboard the Cunard White Star Lines ship Samaria' [8 vII p173] . Arrived New York 3rd October. The colour picture is rather more impressive than the b&w postcard from eBay. 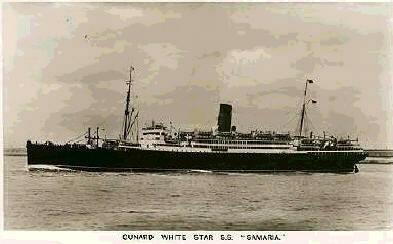 [Dec 2002] According to Cunard, the "Samaria was requisitioned for trooping duties in 1939", and would not have been taking passengers to New York in 1940. I am hoping to clarify this through the Cunard Archive held at the University of Liverpool. Arrival in New York: Thursday 3rd October 1940. According to the log book it was not requisitioned for government service until December 1940. However it did carry troops during the summer of 1940 during its normal service, and I think that this is where the confusion concerning the dates of its war service arose." 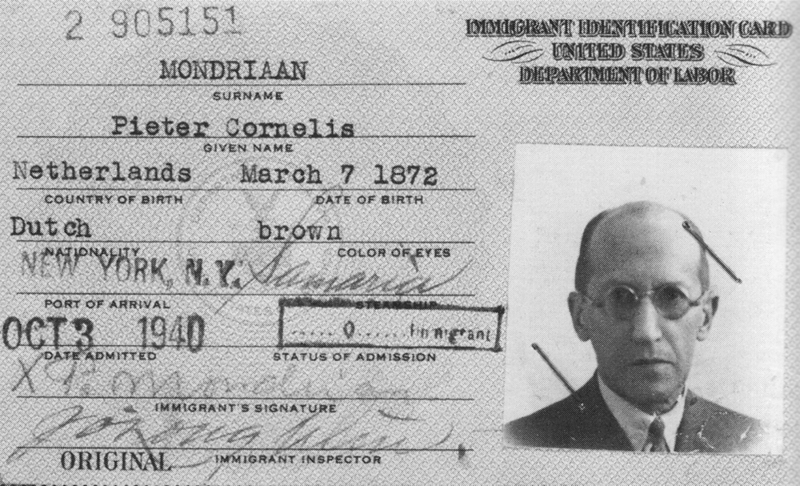 [Jan 2012] From the Haags Gemeentemuseum, Mondrian's US Identity Card. [Aug 2014] The Tate Liverpool exhibition including a copy of PM's passenger record, but it was not reproduced in the show's catalogue. 1940-44 Found a favourable climate for his work in New York and received a great deal of support from his friends and admirers, Harry Holtzmann, Fritz Glarner and James Johnson Sweeney. 1942 A photograph by Arnold Newman of Mondrian in his studio, 353 East 56th Street, New York, 1942. 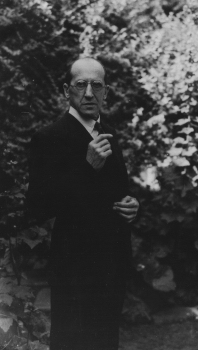 The picture, Mondriaan in his New York Studio, 1943, aged seventy-one was taken by Fritz Glarner. It appears in the catalogue for the 1955 exhibition at the Whitechapel Art Gallery, London. Mondrian's last studio, 15 East 59th Street, New York, 1944. This is the picture Mondrian was working on when he died, Victory Boogie Woogie. 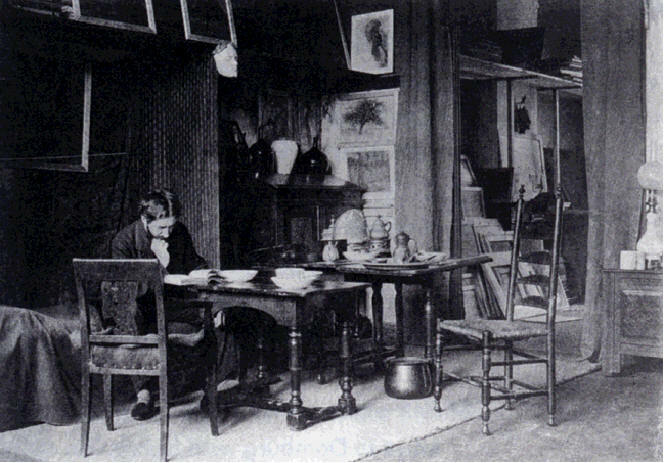 The photograph was taken in his studio after his death. Died on February 1st 1944 in the Murray Hill Hospital from pneumonia. 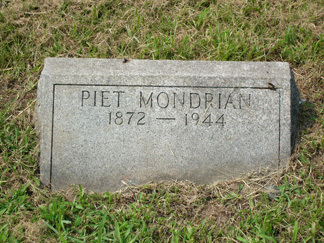 Mondrian's grave at Cypress Hill Cemetery. The colour image is from findagrave.com and was taken by Dagny Haug. 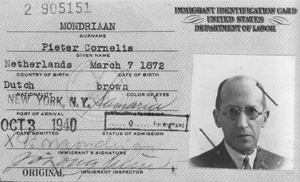 After his death commemorative exhibitions of his work were held in New York (1945), Amsterdam (1946), and Basle (1947); The Hague (1955) and Zurich (1955). In 1945 his articles in English were published in New York under the title Plastic Art and Pure Plastic Art. is an "any year diary" published in 1994 by Bookman International BV. It is written in Dutch but has some excellent photographs. 12 Tate ETC Mondrian's GB registration document was shown in the Autumn 2010 issue of the Tate's ETC magazine, attributed to Yale University Library.